Church Fundraising Ideas below are a great way to raise funds for church, nonprofit organization, etc. 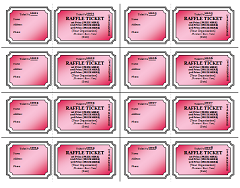 The Fundraising Raffle Tickets below are free to download, modify and print for your next church or organization's fundraiser ideas. The raffle tickets are fun and great way to do fundraisers. This fundraiser has someone that gives a donation such as a new wide screen TV or another valuable item to the church then the church can use the raffle tickets to raise money by receiving donations via tickets for a chance to win the wide screen TV or item of choice. The donors must be told or know that the raffle tickets are a donation to the fundraiser cause, but they will have a chance to win the TV or item of choice. There is also a huge Silent Auction Church Fundraiser Flyer below that is in 4 pages for you to connect together that will assist in a great fundraiser. The volunteers from the church normally give different items or bake different desserts and then the items will be auctioned to raise money for the church or cause. Also, the Annual Fundraiser Goal Flyer below is in 8 pages that you can connect together to make a huge flyer for everyone to watch your fundraiser goal go higher and higher until the goal is met. Bake Sale - Bake sales are a wonderful way to get almost the entire church together cooking and baking and strengthening the bond within your church. Your church can do a simple Bake Sale where everyone cooks what they want to or if it is near Christmas you can do a Christmas Cookie Box Sale where everyone bakes their favorite cookie to fill their box and sell them like hotcakes! Pancake Breakfast - A huge Pancake Breakfast is a surefire way to draw lots of people when there is a good cause behind it, not mention, it is an easy to do and low cost fundraiser. Don't forget when you have any kind of breakfast, lunch or dinner fundraiser to always keep a jar or container labeled "Donations" right next to the cash register. Return to Church Fundraisers from Church Fundraising Ideas.